We are sitting at home with an ice storm outside. through our photos. It's an escape from the cold dreary days that seem to linger in January and February and reminds of the places we love. in the Bayview Farm and Garden Center. 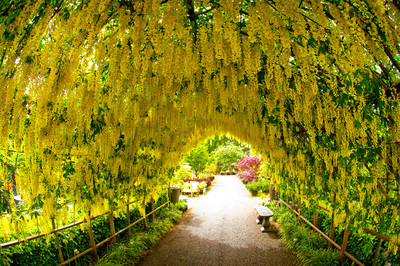 I've seen photographs of the arbor in garden calendars, books and magazines and thought it must be in a large botanical garden somewhere. When vacation planning I discovered the arbor was growing in the middle of a retail garden center outside a charming town we would be visting. 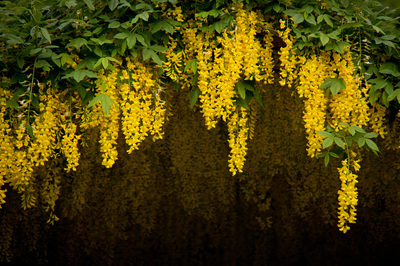 'Golden Chain Tree' blooms in the spring. The trees have been trained onto an arch support. When looking at the photos I originially thought these were prolific vines. I would love to be a loyal customer if we lived nearby. The selection and quality of their plants was impressive. The staff was so helpful and knowledgeable, even giving me advice for my garden in Oklahoma. get these varieties at home. The panicle hydrangeas are stunning! The garden center was a delight to visit in July with so many beautiful flowers and plants in bloom. The dahlias were huge and throughout Whidbey Island I noticed dahlias growing in gardens and in bouquets for sale at farm stands. Hope you enjoyed the armchair tour of Bayview on Whidbey Island. The area is beautiful with so much to do and see. It's so worth the journey! Peace out and stay warm and safe!